I woke up the other morning with an intense craving for passion fruit. It started in the night, actually, dancing around my head as I slept, the scent lingering in the air as daylight crept in. There are a few flavors that I can never resist. Bitter almond. Black cherry. Basil. Passion fruit. Because I order them again and again, there are now dozens of memories wrapped up in each bite, and the minute the thought of them pops up, there is little I can do about it until I'm able to taste it again. 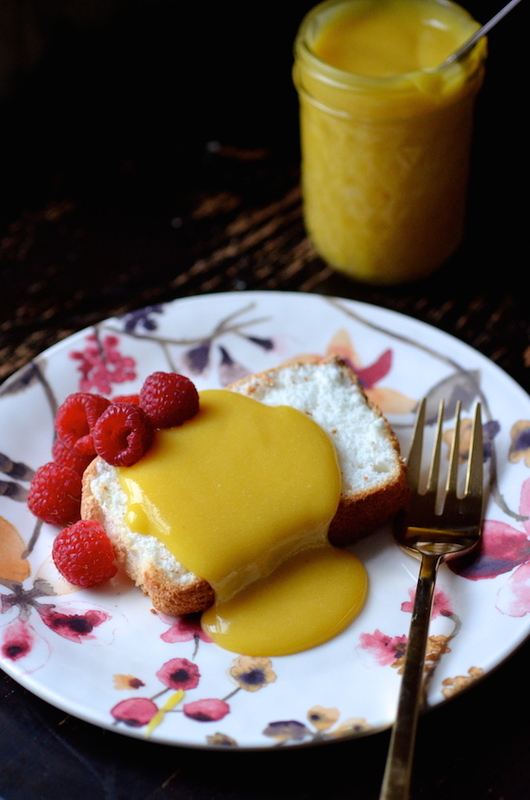 To satisfy the craving this time, I decided I was going to make passion fruit curd. Silky, buttery, and tart, curd is one of my favorite indulgences. I heap large spoonfuls of it over yogurt and top it with coconut flakes for dessert at night. I spoon it over crushed cookies for an easy mug dessert. Or I spread it thin between layers of plain cake, finding it better than any kind of frosting could ever be. Though it seems like the sort of thing that would be complicated, making curd is actually no more difficult than making a batch of stovetop pudding or any other kind of custard. A few ingredients into a pan then a few minutes of whisking, and that's basically it. 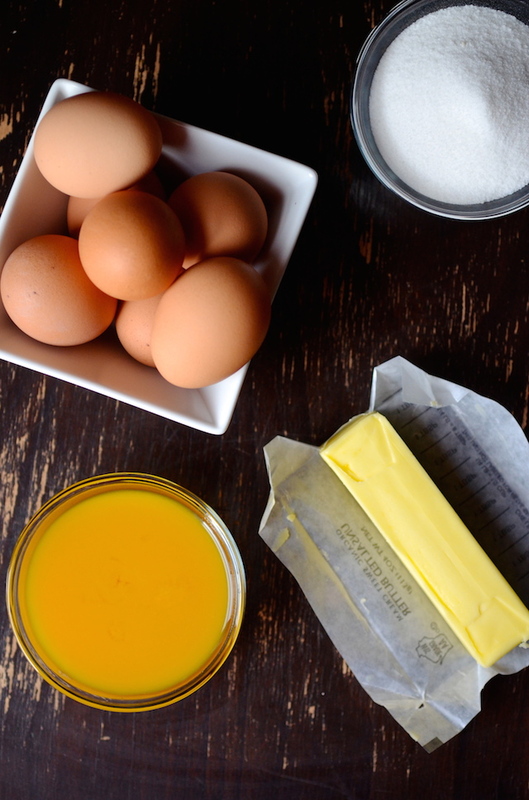 There are versions that use whole eggs and some that use only yolks. 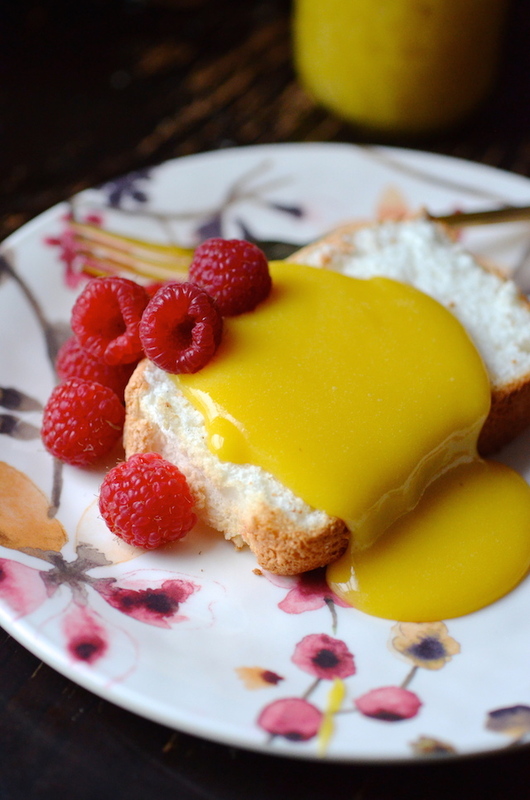 I prefer the latter because I think it produces the smoothest, richest curds (plus it leaves you with a gorgeous batch of egg whites to use for recipes like this easy angel food cake or coconut macaroons!). My most important requirement for any kind of curd is that it not taste "eggy." 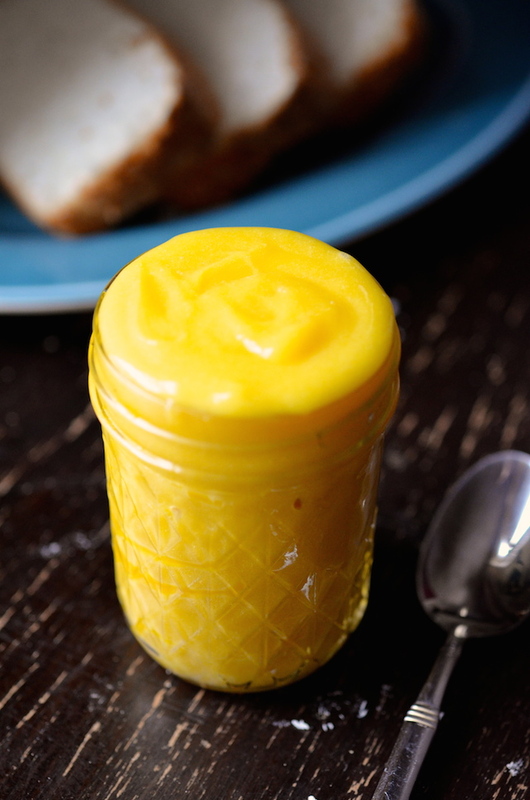 Nothing turns me off from a citrus or other fruit curd than taking a bite and tasting a strong hint of egg. Ugh. Terrible. 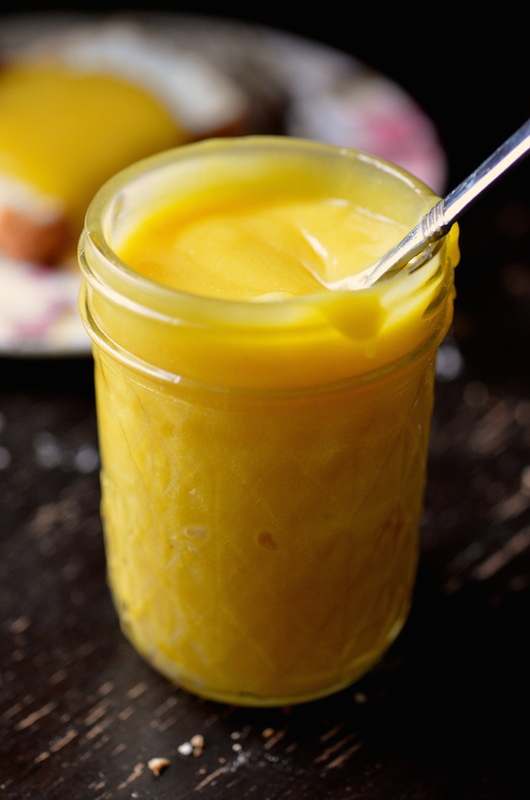 This homemade passion fruit curd is beautifully tart and silky without any trace of egg flavor. If you've run away from curds before because of this issue, I urge you to give this one a try. I think you'll be a convert! This make a lovely large batch of curd that will keep in your fridge for at least a week, and likely more. You can eat it on its own by the spoonful, spread it between cake layers, sandwich it between cookies or macarons, drizzle it over angel food or pound cake or ice cream, swirl it into greek yogurt or oatmeal, or even bake it into loaf cakes and quick breads. It's also fantastic for trifle or parfait style desserts, and can be eaten alongside fresh berries. If you make it, I'd love to hear what your favorite way of eating it is! 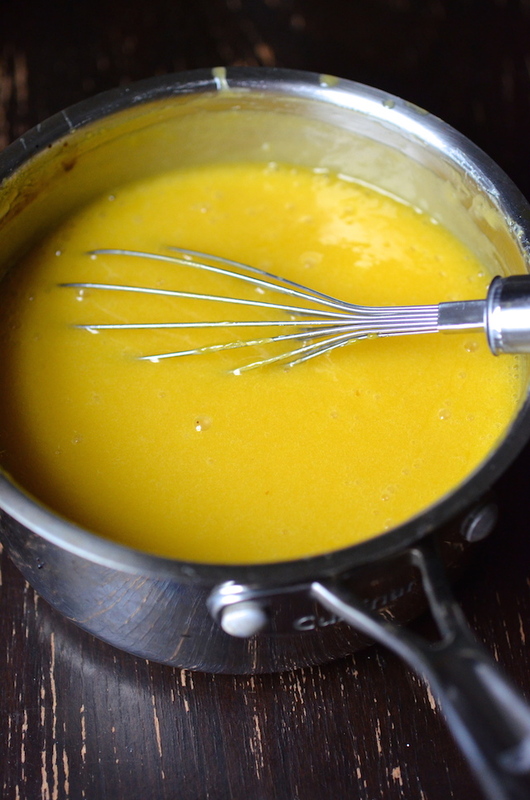 Whisk together passion fruit puree, egg yolks, and sugar in a medium sized heavy-bottom saucepan. Place over medium high heat and cook, whisking continuously until the mixture thickens (about 8 minutes). To test the thickness, dip a spoon in the mixture and run your finger through it. If it coats the spoon and leaves a line when you run your finger, it’s ready. Turn off heat (but leave on burner) and whisk in the salt and the butter, one piece at a time until melted and completely incorporated into the curd. Remove from stove and pour through a fine metal sieve into a bowl (discard any solids that get caught in the sieve).